On this page you find a few examples of Peter's rawhide braiding. 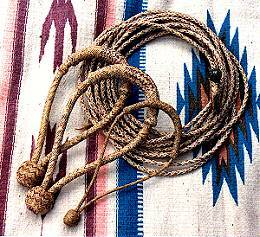 This is a nice 24 plait 3/4" Bosal set, the nose button and heel knot are made from black rawhide and interwoven with natural colored rawhide. The 6 strand Mecate has a matching motta knot. Here are two 16 plait 5/8" Bosals and a 8plait pencil size Bosal on a 65 foot 4 plait Reata. 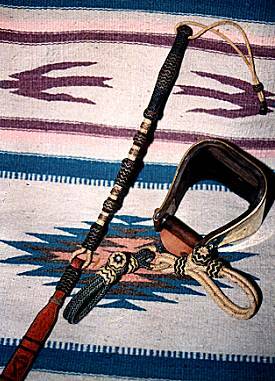 Here you can see a 24 plait collectors Quirt with handle and buttons in black rawhide interwoven with red and natural colored rawhide. 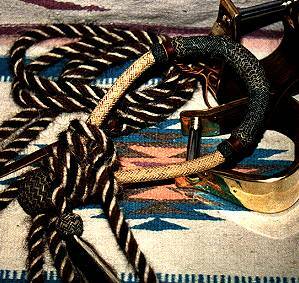 The 12 plait Hobbles are done in black and natural colored rawhide, both pieces are in a private collection.